Heart disease is the number one killer of US men and women - it is so deadly because most signs are vague and often we don’t assign them to having a heart attack. Not always are they so intense or obvious like someone grabbing his chest and having troubles with breathing. Warning signs of a heart attack can be misdiagnosed as heartburn, muscle soreness, flu, and other non-cardiac causes. The higher your risk the more likely those signs mean something is going wrong with your heart. Risk factors include: Age, high cholesterol, high blood pressure, diabetes, smoking and obesity. Anxiety: Just before having a heart attack many people experience feelings of anxiety and extreme nervousness. Chest pain: This is the most classical symptom of a heart attack. The pain is centered, slightly to the left, under your breastbone. Many describe this type of chest pain as “an elephant sitting on the chest”. So whenever you feel an uncomfortable pressure, burning or crushing sensation, squeezing or fullness on your chest and have other signs, don’t hesitate to call for help. Note that not all chest pain is related to a heart disease. When the pain is sharp and stabbing it is generally not related to a heart attack. Shortness of breath: Another common sign of having a heart attack is shortness of breath. It’s like you just ran a marathon and find it difficult to take long, deep breathes due to a tight feeling in the chest. 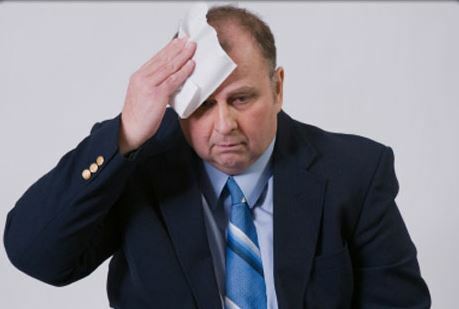 Cold sweat: Another common sign is breaking out in a cold sweat while sitting still. This sign never stands on its own though. Most people who have a heart attack experience chest pressure or pain, shortness of breath and cold sweat all at the same time. Spreading pain: Mostly the pain of a heart attack starts in the chest and spreads to the shoulders, shoulder blade, arms, elbow, back, neck, jaw and abdomen. The pain will mostly spread to the left side of your body. In some cases there is no chest pain, just the pain in these body parts and therefore people often think they have sore muscles. The pain may come and go or it may be a constant pain. Fluid accumulation: Heart failure can accumulate fluids, making your feet, legs, and abdomen swell. Abdominal swelling can lead to a loss of appetite. Those fluids can also accumulate in your lungs, causing a persistent cough or wheeze. Some people even cough up bloody phlegm. Irregular heart pulse: Irregular heart pulses or arrhythmias combined with dizziness, weakness and shortness of breath can be a sign of a heart attack. Light headed: Light headedness and loss of consciousness can occur while experiencing other heart attack symptoms. Fatigue, weakness: Unusual fatigue and weakness can occur in the days or weeks before having a heart attack. Nausea and vomiting: Not the most common sign and especially women feel sick to their stomach when having a heart attack. Not everyone having a heart attack will have the typical symptoms of chest pain, sweat, and shortness of breath.